Deciding between an all-in-one rear-projection TV and a two-part front-projection system used to be easy. Rear-projection systems were cheaper and easier to set up, but front-projection systems have become easier to set up — and the price of high-definition projectors is dropping. You should consider a front-projection system if you want a truly big-screen home theater. For the price of a 56-inch plasma TV or a 72-inch rear-projection TV, you could get a front-projection system capable of pictures measured in the hundreds of inches! Front projection: A front-projection systems includes a projector unit (which is usually mounted on your ceiling but can also be on a lift, on a floor mount, or in the rear wall) and a separate screen. Video sources (such as DVDs, cable, and satellite TV) are routed into the projector, which then turns these signals into light. Then, the light is projected onto a separate screen that’s mounted on a wall at the front of your home theater. If you have a really big room and can keep it dark enough to use a front-projection system, front projection is the way to get that truly movie theater-sized picture. But the dark room is a major must to get the most out of a front-projection system. Also, don’t forget that you’ll need an unimpeded path between the projector and the screen in a front-projection system. 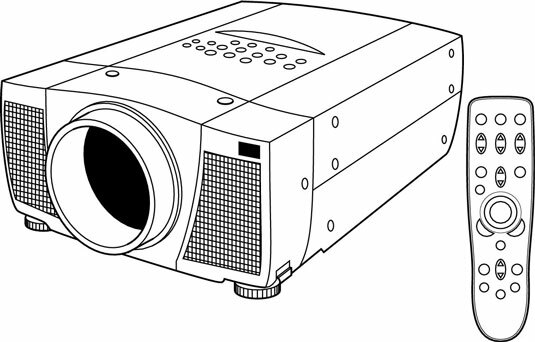 Provide a clear path between the projector unit (shown) and the screen in a front-projection system. Rear projection: These are the traditional big-screen TVs that have been sold for years and years. A good-quality, well-set-up rear projector can offer an awesome picture. 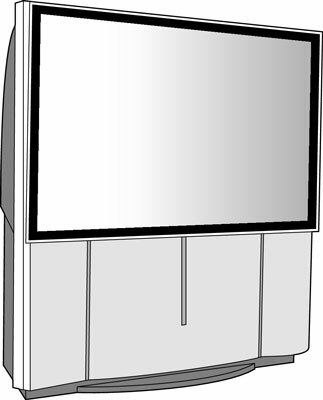 A rear-projection TV (or RPTV) has both parts of the front-projection system (the projector and the screen) in a single, all-in-one box, and the projector illuminates the back of the screen instead of the front. RPTVs are great. But they do have two limitations: a restricted viewing angle and their size. Because of the way video is internally reflected toward the screen in these sets, you need to be perpendicular (or near-perpendicular) to the display to see a good picture. If your home theater room is set up with widely dispersed seating, an RPTV may not be your best choice. Also, rear-projection TVs can be very deep and overwhelm a room with their size. Choose an all-in-one rear-projection system if you have the room for it. The lower cost and easier setup make rear projectors more consumer-friendly. But with the advent of new, computer-based technologies such as DLP (Digital Light Processor) chips, front-projection systems have begun to drop to reasonable prices, and the setup of these new systems is easier, too.